Time for another quick feature update! While you could previously only add one additional donation notification email address for your organization, you can now add up to four. This makes it easy for you to keep your organization’s finance or accounting team up to date on your donations, as they will be directly notified by Donorbox when you receive a donation. You no longer have to play the middle man! 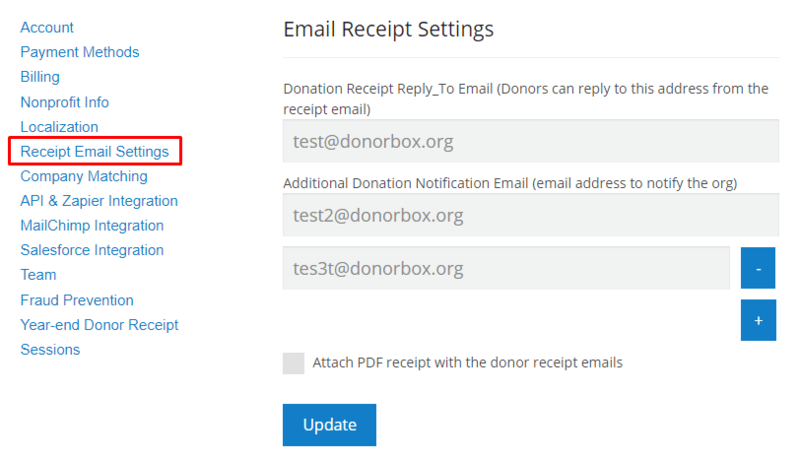 To add an additional donation notification email address, go to the “Account” tab of your dashboard, then click the “Receipt Email Settings” button at the top left of the screen. You can then enter the corresponding email address in the “Additional Donation Notification Email” text box, and click the blue “+” button on the right to add more.